Now that the holidays and my compulsive baking of traditional sweet things have reached their conclusions, I wanted to make something a little heartier and less refined, with just a touch of sweetness and a lot of texture, something I could slip into The Kid's lunch box without a single pang of guilt. I've wanted to try to make a muffin that tastes like an oatmeal raisin cookie, so this seemed like a good time to attempt it. As I set out to assemble the ingredients, the bag of dried cranberries left over from the holidays diverted me from my course. Then, as I started to measure out the cinnamon, I replaced it and picked up the powdered ginger instead. The result was good, but nothing like the original plan. All of the adult tasters gave it a big thumbs up. The Kid wasn't nearly as impressed. I went back to the kitchen and tried to make Oatmeal Raisin Muffins again. Mix lemon juice and soy milk, then set aside. (I use a 2C measuring cup, so that I can measure the oil into the same cup later.) Preheat oven to 375F. Grease standard 12 muffin tin. Sift together all dry ingredients except oats into medium bowl. Stir in oats and cranberries. Combine all wet ingredients, then add to dry mixture. Just barely stir together. Do not over mix! If all the lumps and clumps of white flour are gone, then you've already stirred too much. Divide batter evenly into holes of muffin tin. Sprinkle lightly with turbinado sugar. Bake for 18 to 20 minutes, removing from oven when a toothpick comes out cleanly. Give the muffins a tilt and whack to allow any gases to escape, then allow to cool for five minutes in pan. 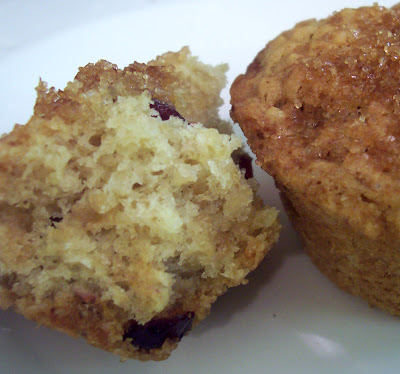 Move muffins from pan to a rack to finish cooling or be eaten, whichever comes first.